Tue, Apr 16, 2019, 08:48 pm SL Time, ColomboPage News Desk, Sri Lanka. Sri Lankan President Maithripala Sirisena said Sri Lanka stands in solidarity with the people of France and the mission to rebuild the historic Parisian landmark. 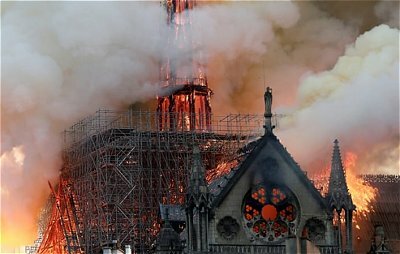 "As a blaze devastates the invaluable Notre Dame cathedral, that inspired devotees and artists over centuries, Sri Lanka stands in solidarity with the people of France and the noble mission to rebuild this World Heritage," the President said in a Twitter message. Foreign Affairs Ministry in a statement expressing sympathies and solidarity to the People of France said Sri Lankans are saddened by the devastation. "We in Sri Lanka are saddened to hear of the devastating fire at the Notre Dame Cathedral in Paris that caused irreparable loss to the heritage of the world. We express our sympathies and solidarity to the People of France at this hour of grief," the Ministry said on Twitter. Firefighters declared success Tuesday after fighting for more than 12 hours to extinguish the ravaging blaze which claimed the 800-year old church's spire and roof. Meanwhile, hundreds of millions of euros have been pledged to help rebuild the partially destroyed cathedral and French President Emmanuel Macron vowed to reconstruct the historic building.